Ten year-old Manami loves her home on peaceful Bainbridge Island. Then her family and other Japanese American members of the community are forced to relocate to internment camps. Manami tries to smuggle her family’s dog, Yujiin, into the camp, but is forced to leave him behind. The foreign circumstances and grief over her lost dog cause her to stop speaking. Instead, Manami expresses herself through drawings she creates every night. She draws memories of Yujiin and writes asking him to find her family. She will only find her voice again if she can work through her guilt over losing Yujiin. This realistic debut tackles a dark moment in US history, when in 1942, President Franklin Roosevelt ordered the incarceration of many Japanese Americans. As is so typical of the experience of a child, Manami focuses on one traumatic change—having to leave her dog behind—and this becomes representative to her of all that her family has lost and the grief they suffer. Sepahban’s story stays true to many elements of the historical account of Manzanar, an internment camp in California. While this is a heavy subject for middle readers, the tale walks a fine balance between capturing the true injustice of the camps without relaying too much for young readers to understand. I love that an author has written something about this moment in our history. I think too often we want to forget the bleakest moments, especially in our own history. To do so leaves us vulnerable to making the same mistakes again. Certainly this story comes as a timely reminder even today, that to judge an entire group of people by the actions of a very small number of radicals, is not only tragic but terrible and wrong. 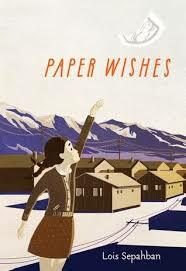 When I read Paper Wishes, it reminded me in some ways of Number the Stars by Lois Lowry. In Number the Stars, Lowry follows the story of a girl whose best friend must go into hiding because she is Jewish. While the story doesn’t delve into the true horrors of Nazi occupied Holland, it does give readers a view into those events that is child-sized, both in its simplicity and its relating of historical facts. Manami learns that her brother has a girlfriend, and her family is unhappy about it. She wrestles with her own feelings about the relationship. Manami learns of a riot in the camp. Her parents rush her inside and away from noises of an angry crowd. One boy has been killed. Another dies soon after. She’s largely sheltered from the actual events. Tagged Children's Literature, dogs, Farrar Straus and Giroux, Japanese Internment Camp, Lois Sepahban, Paper Wishes. Bookmark the permalink.